There was once a man named James Halliday. He liked D&D, then he learned to code, and he and his best friend Ogden started a video game company. They eventually created an immersive VR called Oasis – a place to escape the real world. The real world kind of sucked, so everyone and everything moved into Oasis. James and Ogden became multi-billionaires. Eventually, James dies and starts a game (via his last will & testament) to find an easter egg that he left behind. The first person to find the easter egg will be his will’s beneficiary – they will get all his stuff and all his money. Including his half of the video game company. Parzival – the main character of the book – wants to win. So do a lot of other people. 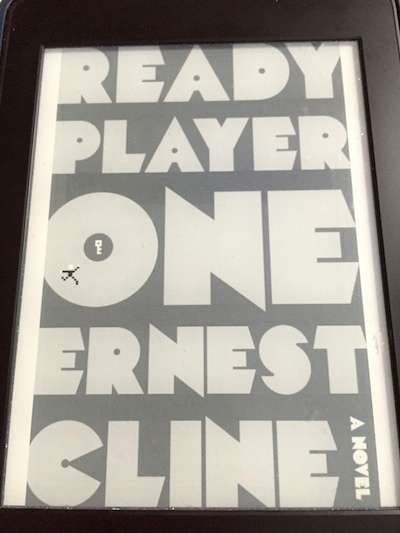 There’s a lot to like about Ready Player One: the constant homage to 80s culture, the quest (I love a good quest), the dystopia that you can totally understand how we got there. * I like that it explores ideas about how slipping into a digital world removes you from the physical world. I do find the idea that life is a game to be won a bit disturbing – winning the quest means money and power. To get all hippy-y, life is necessarily about the journey – it’s about where you go and who you meet and some of what you do, but it’s not about amassing wealth and power. That’s in the book somewhat. But overall, it’s a fun adventure that was a good story to read on vacation. * As much as I enjoy Hunger Games, I do not understand how the US gets into a place where that society functions. It seems inherently unstable.